I wasn’t going to blog this idea, it being so manifestly impure and all, but it showed up on the BOS list and Jeff Rutzky has been having so much fun with it, I just had to write. 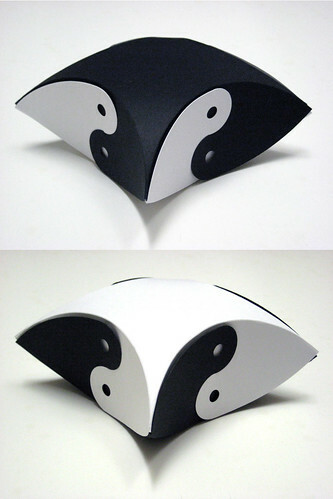 Some months back, I made a curved surface fold from the traditional cocaine paper and called it the pillow box. Then, I started reading Geometric Folding Algorithms by Erik Demaine and Joseph O’Rourke — kind of a slow read for me. Although clear of prose and exquisite of illustration, it’s way above my understanding. Co-workers, observing me read it at lunch, report that they can see a small cumulus cloud above my head, with a dancing monochrome mouse in it and Turkey in the Straw played upon one string. The authors therein describe the teabag problem and I thought to myself, didn’t I fold that already? That won’t stop me from folding it a million times more. A bit of research reveals that Andrew Kepert of Newcastle University probably folded it a few years ago, but can I find his website? No. If you can, let me know. Anyway, here are some dreadfully impure crease patterns to play with, you know, if you don’t mind taking a shower afterwards. The version pictured at the top crease pattern. A version better adapted to cardstock crease pattern. 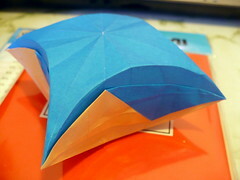 This entry was posted on Sunday, April 6th, 2008 at 6:05 pm	and is filed under box, circle, crease pattern, creative commons, curved surface, open source origami, tetrahedral. You can follow any responses to this entry through the RSS 2.0 feed. You can leave a response, or trackback from your own site. You seem to imply that Teabag Problem researchers, in particular Andrew Kepert, may have “discovered” this pillow box model before you did. It kinda seems like comparing apples and oranges to me. 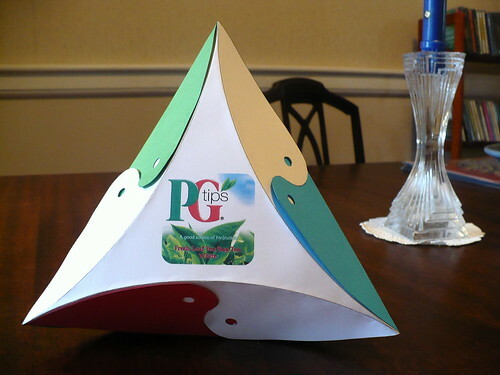 The people working on this problem were trying to inflate a teabag (two square pieces of paper put on top of each other with the edges glued together) to find the maximum volume it can contain. I seem to recall reading about such research suggesting a 3D form similar to (or exactly the same as?) your pillow box as an approximation to the solution. But these people were not looking to fold such an object from a single square of paper, so I would doubt that they did that. and take a peek at it (although not all of the pictures work). I was assuming Kepert took his thinking farther than he did. (Thanks for mentioning the archives — I tend to forget them.) But it’s evident from the pictures I can see that this is where he was tending. But I have a way of doing the volume without recourse to that unpleasant integration business. Just need to grok some more Archimedes, first. 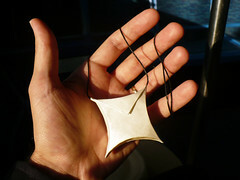 I just thought I’d mention that I think you can make a regular icosahedron (http://en.wikipedia.org/wiki/Icosahedron) from the triangular units. I’ trying it now.